Commissioned, and made specifically for the permanent collection, on exhibit at the Pennsylvania Convention Center, in Philadelphia, Pennsylvania, this piece is the artist’s re-interpretation of his earlier work, “The Sway of Public Opinion,” made in 2007. Litwin’s kinetic works are representative of a relatively modern development among sculptural forms, namely working machinery. First examples of this were conceived by Marcel Duchamp, at the beginning of the 20th century, further explored by Alexander Calder, and others. Intending to further acceptance of this discipline in the mainstream of fine art, Litwin’s practice is informed by a fascination with cognition and human perception. Pressing the red “Start” button, found at the front of the display case, will activate the sculpture. The mechanism of the large turntable, and the central spindle, are driven by an electric motor, geared to turn each in opposite directions. 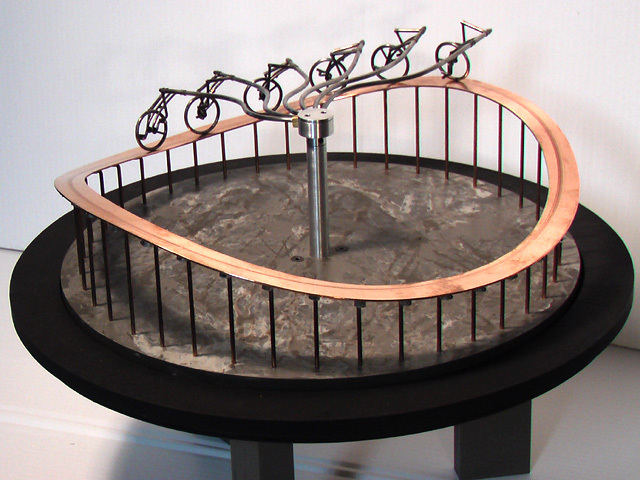 The cyclers’ pedaling motion is only the product of their wheels rolling along the moving track.